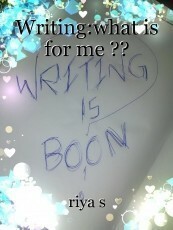 Writing:what is for me ?? Is writing a boon for me ? My dear gentlemen and dignified ladies,I am defnetly not writing to please you or I want no reader to my writing. © Copyright 2019 riya s. All rights reserved. January 2018. Picture Prompt 4. This page was created in 0.4327 seconds.